Patterson Pope has been the leader of high density storage solutions for decades. What does that mean for businesses and organizations in Greensboro? It means that an organized system of storage is only a phone call away. We provide mobile shelving and high density storage solutions to a wide range of industries throughout the Greensboro area, including: businesses, manufacturers, schools, libraries, museums, medical facilities, government and athletics. The professionals in these industries have jobs to focus on and that focus can be derailed if the work environment is in disarray. We are here to help. Every product that we offer is designed for a very specific purpose. When you work with Patterson Pope, we help you customize a high density storage solution, so that when we finish, you are 100 percent happy with the results. People in Greensboro get it. They understand that professional high density storage systems are necessary in order to keep their day-to-day operations flowing smoothly. Take hospitals for instance. An impeccable storage system must be in place for items such as sterile supplies, medical equipment and prescription medication. 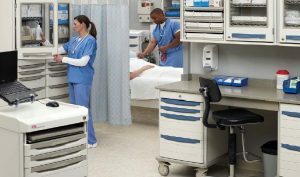 That is why hospitals depend on our mobile shelving, high density storage systems, and medical carts. Public safety buildings in the Greensboro area need professional assistance with high density storage needs, as well. 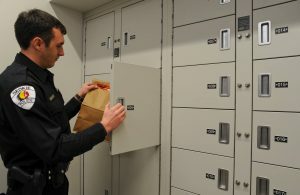 Law enforcement officials need a safe and secure storage unit to store evidence, gear and firearms. They come to us for our lockers, weapons racks and gun boxes that were designed specifically for that purpose. Almost all of the items we put in storage are valuable. Whether you need to store expensive medical equipment, biological evidence or historic artifacts – it isn’t worth the risk of storing it in a one-size-fits-all unit that has not been designed for the specific purpose. Don’t put items that are valuable to your office at risk. 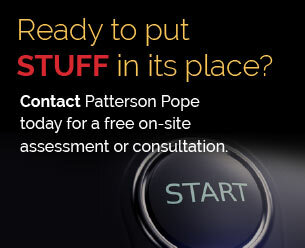 Call the experts at Patterson Pope. We are happy to help! Our team at Patterson Pope proudly provides mobile shelving and high density storage solutions to the greater Greensboro area, including: Winston-Salem, Lexington, High Point, Kernersville, Asheboro, Burlington, Reidsville, Madison, Elon, and other surrounding areas.